Facebook Messenger is an instant messaging service and software application which provides text and video communication. Like Facebook's web-based Chat feature, it supports the open-source XMPP protocol, connects primarily between Facebook users and synchronizes with the website. Messenger For was released on August 9, 2011 for iOS and Android, with an October 11 update making the app available for BlackBerry OS.Its functionality was unbundled from the official Facebook for Mobile application, allowing for chat messages to be sent and received with notifications. 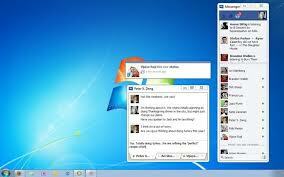 Messenger for Windows Desktop was "officially" released on March 5, 2012 for Windows 7 users. Testing on the software began among a limited beta tester group on November 21, 2011 however, a leaked link to the beta-stage software was publicly revealed to tech bloggers by Israeli blog Tech IT. Facebook responded the same day by announcing the link's availability through its Help Center. Among its features is a "ticker" similar in function to the sidebar of friend activity seen by Facebook website users. At the time of release, "chatting with multiple friends, video calling, limiting chat availability and editing settings" were not available through the software. A Mac OS X was mentioned by Facebook developers as forthcoming.